During a rough week for Massachusetts Sen. Elizabeth Warren, there’s been an unexpected turn. In the midst of the controversy surrounding the Democrat’s long-time claims of Native American ancestry, and her revelation of DNA results of 1/1024 Native American DNA, there was at least one news item that might excite the Harvard professor-turned-liberal lawmaker. Warren actually has been given a spot in the National Museum of the American Indian in Washington D.C., in, of all places, the Pocahontas exhibit. But sharing the placement with her is none other than her arch foe, President Donald Trump. According to The Daily Caller, Trump and Warren’s photos in the exhibit include an explanation on a digital screen. 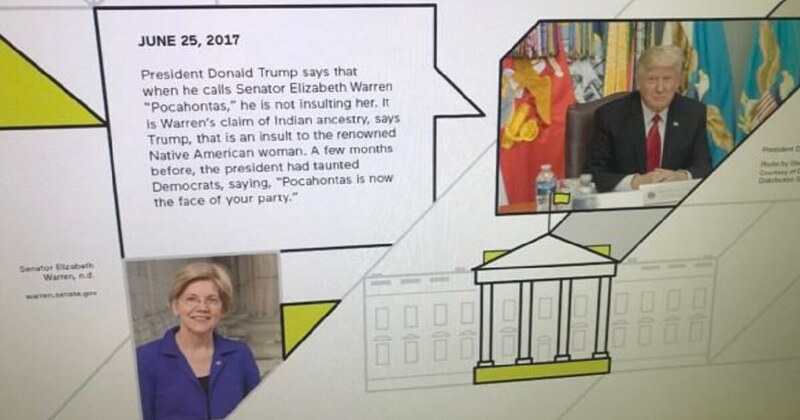 “President Donald Trump says that when he calls Senator Warren ‘Pocahontas’ he is not insulting her,” the caption reads – going on to characterize Warren’s Native American ancestry story as “claims.” The Cherokee Nation has blasted her attempt to argue the paltry amount of Native American shown in her DNA results justifies her claim to Indian heritage. According to a Science Magazine article pubished in 2014, DNA Genetic Testing and Analysis company 23andMe released some interesting findings regarding the genetic make-up of Americans and they are not kind to Warren and her Native American claims. Do you think the museum was taking a shot at Sen. Elizabeth Warren with the placement and explanation?